The 62nd annual EAA AirVenture fly-in convention will be held from July 28 to August 3 at Wittman Regional Airport in Oshkosh. Meet AvMap at Hangar C - 3024-2025! EAA Airventure attracts every year 10,000 aircraft and more than 500,000 aviaiton enthusiast from more than 70 countries. Italy will be represented by AvMap, showcasing its latest Avioncis Systems and Instruments. 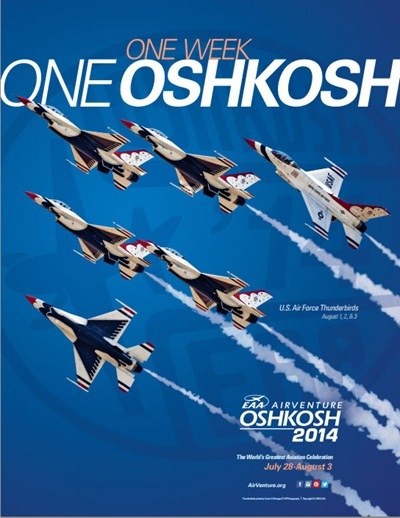 At Oshkosh you can find everything and be involved in many activities: you can enjoy the Thunderbirds fight show, as well as night air shows, attend an auction for the a special version of a Ford Mustang inspired to the Lockheed Martin F-35 Lightning II, and even collaborate to build a Zenith CH 750 in one week! Every night you can join The Flying Musicians Association “AirVenture MusicJams”! Each night will open with a scheduled performer, who will be followed an Open Jam. Do not miss the Team Aerostars graceful aerobatics show on Friday 1st and Sunday 3rd of August.